If you are an adsense user then you might know that by default we cannot change currency in Adsense performance report. But from now onward we can change that currency to view adsense report. Google adsense today announced this feature on it’s official blog. Here how we can use this feature to view adsense earnings report on your country currency. By default google adsense shows performance report in USD-US Dollar ($) currency. And we don’t have any option to change currency in Performance report. Now we can change currency to any other country currency to view our adsense performance report. To view this new feature or to view your adsense performance report in your country currency, then follow below steps. 3. Now you will see the new option called Currency. This is the new feature which is added on Adsense. To change that currency, just click on drop down box and choose the currency and click Apply button to view the adsense report on that currency. As you observe my report is now displaying in Indian currency. You view CPC, RPM and Estimated earnings in your currency by this new feature on your adsense Performance Reports tab. 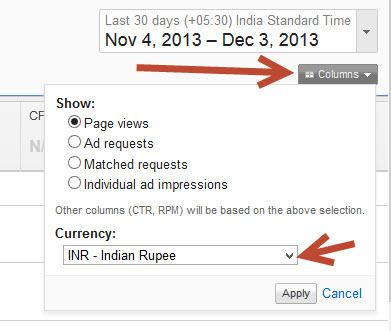 Very useful post, adsense earnings now shows in INR! i want to ask something when i create my account that timw i was in pakistan . But now i m here in dubai. So now can i get my Earning through wetern union in Dubai?